Day after day I am blessed with surprises in our natural world. Often the unexpected moments are positive and can be explained. Other times, I just shake my head and wonder when I have no idea of the causes. Then there are the incidents, like today, when I can account for two ducks that no longer exist. Following are my cases from this day. 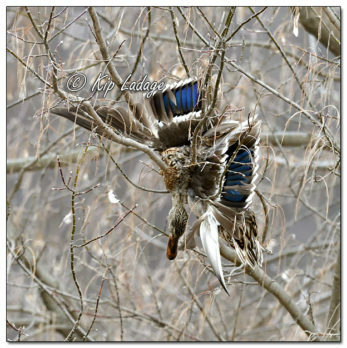 Case #1 – As I drove down a rural highway, an unrecognizable item hanging in a tree caught my attention. Actually, I saw the unusual shape of the object, but it was the two patches of color that identified what I was seeing. Somehow this female mallard duck became entangled in the branches of this tree. Due to the location I did not get out to unravel the mystery. I can only confirm that the duck was hanging dead in the tree. Case #2 – Either the weather weakened or squirrels chewed on the rope holding my duck box against a tree at our cabin. Whatever the cause, the box fell to the frozen ground. I took the box home to reinforce the lid to the body of the box. As I removed the lid I noticed the nest box was still full of leaves (nesting material). 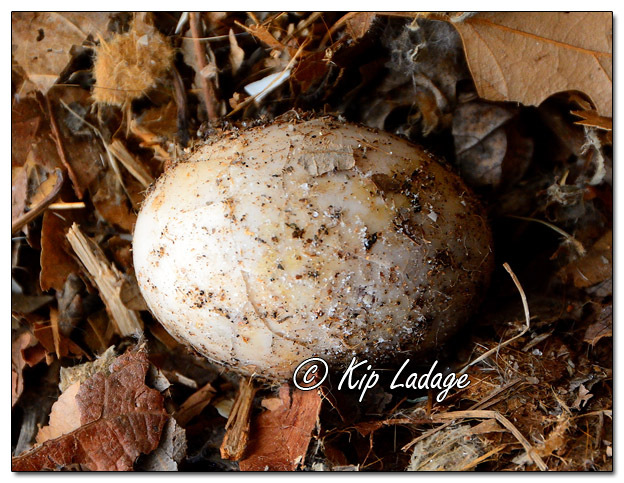 When I took the box outside and dumped the leaves, I was surprised to find an unhatched wood duck egg in the nest material. I suppose an unhatched egg is not unusual, especially since sometimes the box is really filled with two broods when another hen drops her eggs on the first nest. Regardless of the cause, the world had one less wood duck this fall to decorate the wooded wet places when this egg did not hatch.